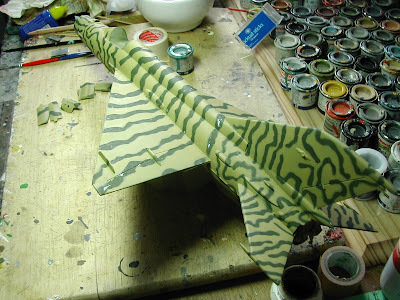 A poke around under my bench recently revealed a MiG 21 in 1/32 scale. It was the Revell kit I'd bought last year. At the same time I picked up a set of Microscale decals. I had a very specific colour scheme in mind when I bought them. I did some of the work on this model late last year but became too busy to continue with it. A momentary lull in work has given me the chance to pick it up again. I'd chosen the Indian Air Force scheme from the Indo-Pakistan war in 1971 - a really interesting scheme and something of a challenge. 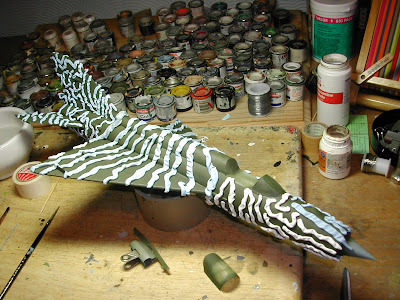 With the build largely complete, the model was undercoated and then sprayed in US dark green. After 24 hours drying time I was able to mask up. To achieve the 'pyjamas' effect, I decided to use Blu Tac. As you can imagine, I needed a great deal of it! It was very time consuming, but I felt that any other method would not produce the result I was after. 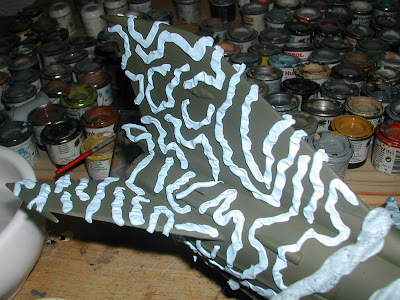 I sat for hours rolling out long thin sausages of Blu Tac ( and then White Tac when the Blu ran out), carefully shaping them with the end of an old paint brush. Check the photo - the model in the grip of an alien face-hugger! In spraying on the next colour I used a beige-green. This job had to be performed with great care. I needed to angle the airbrush to get in the corners - hundreds of corners - and apply it in layers to avoid rapid paint build up. Later I carefully removed the Blu (and White) Tac. This revealed what you see in the last photo. It isn't perfect. Certain areas need a bit of attention, but it has the basics of a good job. 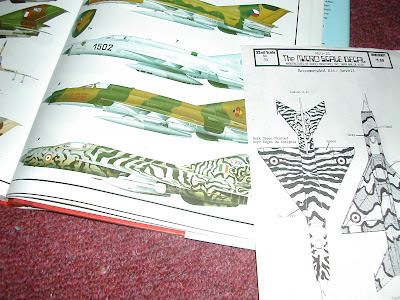 This MiG 21 now has its pyjamas on, I just need to sort out their fit.